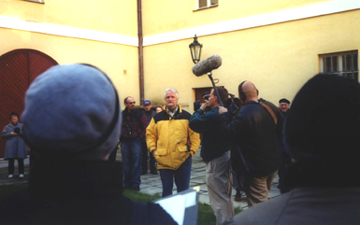 Nick Strimple (center) filming a documentary in Terezín, 2000. During the Beverly Hills International Music Festival's Voices of Hollywood concert showcasing some of the entertainment industry’s top composers: (l-r) Gernot Wolfgang, Bruce Babcock, Gregory Cherninsky, Aaron Zigman, Nick Strimple, Bruce Broughton, and Don Davis, 2006. Lucille Ball and Jimmy Stewart with Nick Strimple (on far right) during taping of A Beverly Hills Christmas with Jimmy Stewart, 1987.